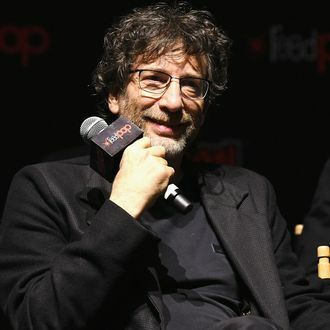 At New York Comic Con 2018, Neil Gaiman and the cast of forthcoming Amazon Prime series Good Omens talked about the inception and creation of the show, which stars Michael Sheen, David Tennant, Miranda Richardson and Jon Hamm. The six-episode series, about an angel-demon duo and a scrappy group of kids who work to prevent the end of days (heralded by the four motorcyclists of the apocalypse, of course), is adapted from the 1990 novel co-written by Gaiman and renowned fantasy author Terry Pratchett, who died in 2015. Well, if we can take it from Mr. Freddie Mercury himself, “Beelzebub has a devil put aside for me,” and Armageddon looks like it’s going to be a riot. Good Omens will premiere in 2019.